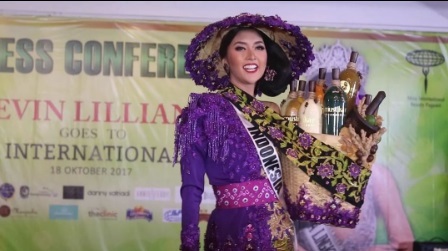 National Costume of Miss Indonesia Kevin Lilliana for Miss International 2017 pageant in Tokyo, Japan. MBOK JAMU AND ANCIENT SECRET POTION! This theme is inspired by Pageant Lovers named Imam Syafei (@ imam.safii05) which is reprocessed by the talented local designer Annisa Feby (@annisabanyuwangi) and is supported by the Banyuwangi District Government. Herbal medicine is a traditional medicine made from natural KUNO INDONESIA that has been passed down from generation to generation that is efficacious for health. In the past, herbal medicine only for the palace and diracik by traditional medicine / healer of medicine. But now herbs can be formulated in home industry one of the marketing is to include processed herbal medicine into bottles are arranged in baskets and picked up by the herbalist. Until its name is called MBOK JAMU GENDONG. This herb is sold around and consumed by all circles. Mbok Jamu usually carry 8 bottles containing KUNIR ASAM, RICE KENCUR, CABE PUYANG, PAHITAN, KEY LOCK, SUDU LAOS UYUP-UYUP AND SINOM. Do not forget also eggs, lime, honey and hot flasks to mix herbs bungkusan. Mbok Jamu also brought a bucket containing glass and a little water to wash the glass used by the buyer. Currently the government is fighting for herbal medicine can obtain world recognition from UNESCO. Herbal medicine will continue to grow along with the global development with the trend of "BACK TO NATURE CONCEPT AND HEALTHY LIFESTYLE". JAMU, HERITAGE AND INDONESIAN CULTURE!